The CVR Terramax tyres from Sailun are perfect for on road journeys with some limited off road use to ensure your journey go take you anywhere. Excellent performance levels are combined with unbeatable reliability, durability and comfort to ensure you get the best use and value out of CVR Terramax tyres possible. These options feature excellent dispersion levels for tricky conditions and off road situations and high levels of wear resistance to make sure they don’t let you down. 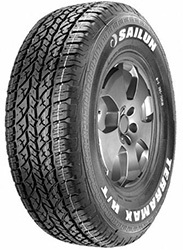 The CVR Terramax tyres from Sailun are perfect for on road journeys with some limited off road use to ensure your journey go take you anywhere. Excellent performance levels are combined with unbeatable reliability, durability and comfort to ensure you get the best use and value out of CVR Terramax tyres possible.These options feature excellent dispersion levels for tricky conditions and off road situations and high levels of wear resistance to make sure they don’t let you down.